I love board games, especially those with lots of great-looking components. It’s fun to gather around the table, set everything up and have a great time with family and friends. What’s not fun about playing board gams is cleaning up. A few years ago, we shared some tips for storing your board games and puzzles. Today, I’m going to expand on that post and share ideas on storing pieces to component-heavy roll playing games. Games in this category often ship with several decks of cards, many dice, miniatures and “bits” as I call them, referring to the small game pieces that don’t fit into any of the preceding categories. Opening a new game for the first time can be fun. My kids and I love to see what we got in each new box. Enjoy that excitement, but make mental notes at the same time. For instance, many games arrive with components that need to be punched out before play. They won’t lay nice and flat after you do that. Also, note if there’s a lot of one type of component: cards, dice, figures, bits. This will help you decided on what to use when it’s time to pack up. Finally, consider the insert(s). Will all your stuff fit back in the box neatly or is there real potential for a jumbled pile? Once you’ve answered those questions, it’s time to pick a re-packing strategy. Card bags. These are sold in a variety of sizes to accommodate cards from nearly any game. 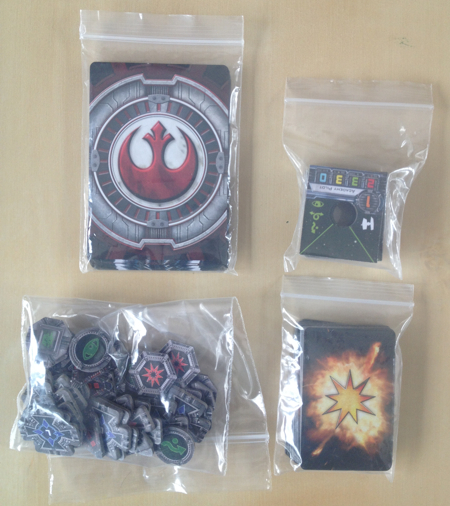 Bags Unlimited sells several varieties, from bags meant to hold a single card to those sized for whole sets. Several colors are available, too, which might help you remember which cards go with which game. Amazon also sells large sets very inexpensively. Also, using protective bags is a good idea for paper items if you store your games in a damp basement. Zip-top Bags This one’s pretty obvious, but I’ll mention it anyway. Larger Ziplock bags can be used to store all sorts of components. Push the air out before resealing to reduce the amount of space they consume in the box. 35mm Film Canisters Remember these? They’re insanely useful once you’ve removed the film. Use a canister to store bits, dice, or other small and easily-lost pieces. Label the lid for easy reference. Nuts and Bolts Drawers These storage drawers offer many little drawers for components (there are 25 on this one) that are easily labeled with a label maker. Consider keeping it out if you have a dedicated gaming area, or pack it away with the rest of your game materials. Go for one with see-through drawers for additional ease of use. Custom Foam Board The interior of many game boxes store pieces perfectly in their shipping state. That often changes once you’ve played. 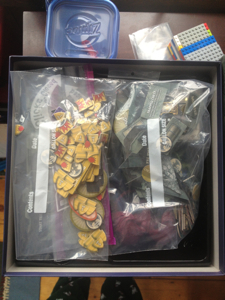 You can buy some inexpensive foam board from a craft store and cut it to make custom compartments inside the game box. It’s easiest to trace the box on a piece of paper first, layout the components and figure out how it would work. Then measure, cut and insert! Your box is now perfectly capable of storing everything neatly. Small Tupperware with Lids Get those little bowls you used for snacks when the kids were small out of the kitchen drawer and repurpose them for game pieces. I even use these during gameplay to keep bits from getting strewn across the table. When my son and I play The Legend of Drizzt, we store the tiny hit point tokens and other small items in these bowls on the table. That way they’re easy to find and grab as needed. Volitive candle holders work for tabletop storage, too. There are several suggestions to keep your game pieces organized and neat. Not only that, it saves on wear and tear of the pieces. Components that don’t jostle around stay looking nice longer. Some of these games are expensive, and pieces are difficult or impossible to replace. Now if you’re really ambitious, check out this custom solution built entirely of LEGO. I am blown away. You can also use the see-through plastic containers from prescription medicines when you’re done with the meds. Mine now come with labels that peel off easily so you can reuse the containers after washing them out. I find they can hold lots of stray bits, and you can tell which ones are which because the container is see-through. For complicated games like 7 wonders or Agricola, a cheap Plano Tackle box is great! It not only keeps the pieces organized for storage, it makes the mechanics of the game easier. Why no mention of small tackle boxes? These can be had for a few bucks each and make board game organization super super easy. Card sleeves have been a game saver for some of our more delicate card based games – like the original printed on cardstock “Gimme the Brain” cards. Here’s a boardgamegeek.com forum thread on the plano tackle boxes. The small 3448 size is only around $1.50 at the Wall. One of them is perfect for all the little pieces of Elder Sign. We like to use bead sorter/storage containers from the craft store. They’re cheap, they come in a lot of different sizes and some of them have adjustable sized interior compartments. I love all these ideas! I like to use the zip top gallon size for the brainbuster wooden puzzles as well. There are so many pieces that if you are missing one, you will never finish the puzzle. You don’t run into a lot of 35mm film canisters now-a-days but anything that you used to use them for can now be put in the canisters that diabetic test strips come in. They are sturdier than the film canisters, the tops are attached so they don’t get lost and I’m sure all the diabetics you know would be glad to save them for you. Throwing them away seems like such a waste. They are so high quality that mine are black plastic lined with white plastic. Glass baby food jars! I have endless baby food jars, and although I mostly recycle them, I do keep a small stash. They would be ideal for storing small game parts. My husband uses them for storing nails, screws etc. I store hairpins, buttons, safety pins, and all those tiny little things that need a home. Clear glass, easy to get into. I love playing Settlers of Catan, but five of the friends I play with already own it (inc expansions.) I don’t play it with anyone else. SO my unclutterer solution is not to buy it for myself. We have found with simpler games that they are hopelessly overpackaged – the easiest solution for us is to toss the box, label the board and put the parts in a small box (all of our “classic” games’ pieces fit in a set of 4″ square drawers that we had laying around). We have also found old metal lunch boxes to be a fun and convenient solution for games that have too many parts for the small boxes, but not enough to use their original packaging well (all of the Apples to Apples cards fit in one, even though the original game box is at least twice the size). Plus, a lot of games use the same pieces, so if you play enough that you don’t forget what you need for each game, you can keep a single set of things like pens/pencils, pads of paper, dice, place marker pieces and a timer and still have everything you need for a ton of different games. Its worth keeping the box if you want to sell the game in future.